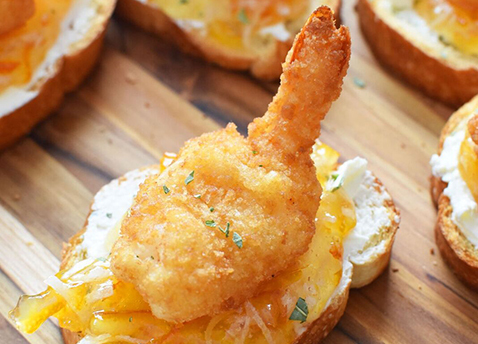 Jumbo Butterfly Shrimp on crostini means jumbo flavor, jumbo-sized bites, and a jumbo hit for any party (recipe from Sizzling Eats). Heat oven to bake shrimp according to package instructions. Mix butter with garlic powder and herbs and brush crostini rounds. Toast alongside shrimp for 3-5 mins. Remove crostini from oven and smear with cream cheese. Once shrimp are done, set aside. In a small bowl, mix the coconut and marmalade together. Smear a dollop on the cream cheese-covered crostini. Top with shrimp & enjoy! 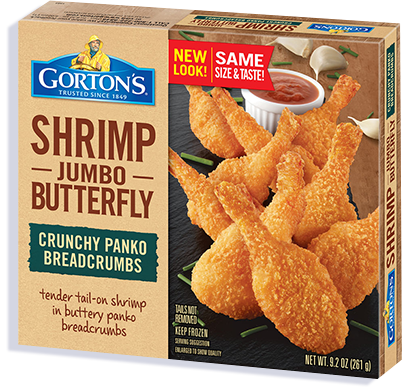 Tender tail-on Shrimp in crunchy panko breadcrumbs.